Curtis Hartley scored for Stamford. 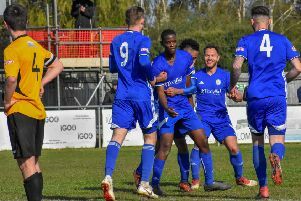 Stamford’s battle against relegation in the Evo-Stik League Northern Premier Division received a boost last night (March 30) when they won 1-0 away at Barwell. Curtis Hartley scored the all-important goal in the 39th minute. The Daniels remain in the relegation zone but are now just two points from safety with six games left to play. In the ChromaSport & Trophies Peterborough League Premier Division, Pinchbeck were 6-0 winners at Deeping Rangers Reserves last night. Their goals came from Nicholas Bishop, Ian Dunn, Jamie Francis, Ashley Murrell, Liam Ogden and Tom Sergeant.